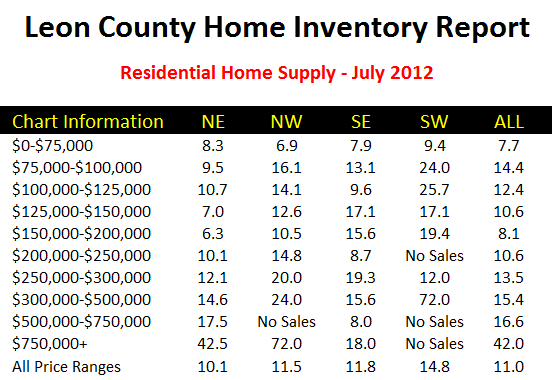 In case you missed the message on Twitter (or Facebook), the July 2012 report on housing supply and demand in Tallahassee has been published over at our Market Reports Blog. We have to keep a close study on the housing supply and demand in Tallahassee because we are moving to a new stage of the housing market recovery where [hopefully] an increase in home sales is going to create pockets of imbalances in the market. REMINDER: You can download a .pdf version of the Monthly Market Report anytime you like (available each month) from the Market Report link in the navigation bar on top of the Tallahassee Real Estate Blog (or simply click on the image to the left). We might see some "false positives" on real estate values due to a perceived shortage of homes available, but the totality of the supply and demand situation will still rule the day when it comes to a direction change in real estate value trends. 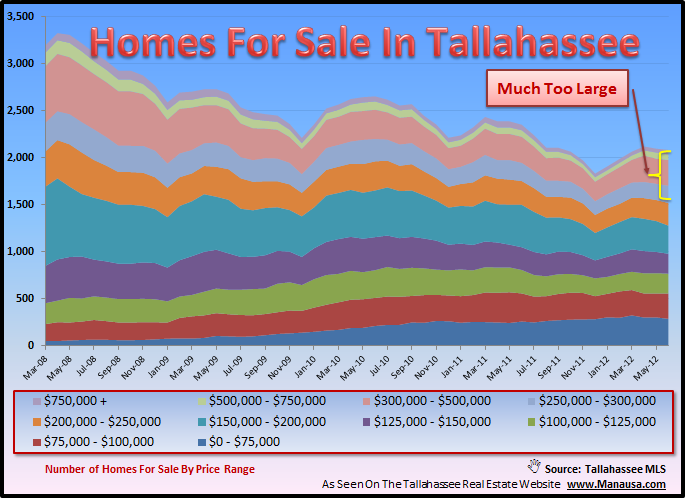 When we examine the current inventory of homes for sale in Tallahassee in the real estate graph below, it's important to understand we are starting to see a split in the market. Homes priced under $150,000 are heading towards market equilibrium (and hopefully will be there within the next 18 months), while homes priced above $250,000 have many, many more years worth of supply. We can view the same information in a table format below, and I want to remind our readers that "market equilibrium" is considered a balanced market where buyers and sellers stand on equal footing and the months of supply of homes runs between 5 and 6 months. The "false positives" that were mentioned above refers to the point when we see lower price points begin to move towards the market equilibrium stages (6 months of supply). I expect homeowners to believe that values will begin to rise, only to find that homes priced in the higher price ranges begin to lower their prices, resulting in new inventory in the lower price ranges. This "trickle down effect" will be required to clear the multiple-year inventory that is available at the higher price points. If you want to know more about the history of housing supply and demand in Tallahassee, just check out our Tallahassee Real Estate Market Reports blog where you will find many years' worth of charts, graphs, and analysis of the Tallahassee real estate market.